Slip into those parachute pants and grab your Aqua Net as cover band Rubix Kube takes you back with the sweet sounds of the 1980s. The Back to the Eighties show reminds us exactly how video killed the radio star. 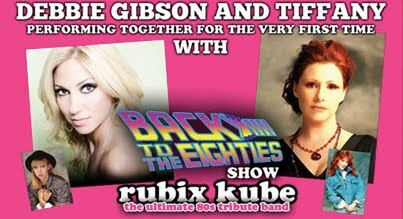 And because any retro night just wouldn't be radical without special guests: 80s icons Debbie Gibson AND Tiffany will perform together for the very first time. Totally awesome!